Probate courts oversee the administration of property after a person's death. The Law Office of Frank Marciano is experienced in all areas of probate law, and we encourage you to contact us to discuss any probate issues. When someone dies, either with or without leaving a will, there are often estate matters that need to be handled, such as changing a property's title and completing tax forms. During probate, the court supervises the process that transfers the legal title of property from the estate of the person who has died (the "decedent") to his or her beneficiaries. The last wishes of the decedent are carried out by the executor/executrix along with the guardian and or trustee if called for in the will. We often represent the executor/executrix of an estate to help them carry out the directions set forth in the Last Will and Testament. Transferring property when someone dies can be complicated. If someone close to you has died recently, we strongly encourage you to have one of our probate lawyers handle the outstanding legal matters on your behalf so that you can focus on taking care of your family during this time of loss. If someone who owes you money has died recently, you may have to file a creditor's claim in probate court in order to collect your money from the estate. There are very strict time limits for filing your claim, so you should contact a probate attorney right away if you have a claim against a decedent's estate. 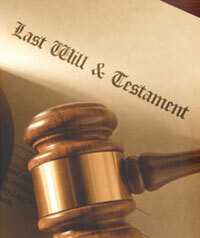 To set up a consultation concerning any probate or estate matter, contact us online or call us at (201) 656-1000.